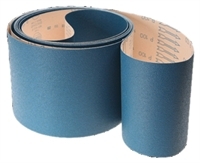 Zirconium Wide Paper Belts, KP950. Applications: Zirconium is a hard abrasive and these belts are thus ideal for graining harder sheet alloys such as stainless steel. It is also highly effective on hard woods. Although 2 popular sizes are listed here as examples, they can be made to suit any wide-belt machine up to a maximum of 1450mm. Please contact us for a quote. Product Notes: 'F'-Weight paper giving a good balance of stiffness and flexibility. Available in grades up to 220 for fine finishes. If your requirements are not listed below, please contact us.